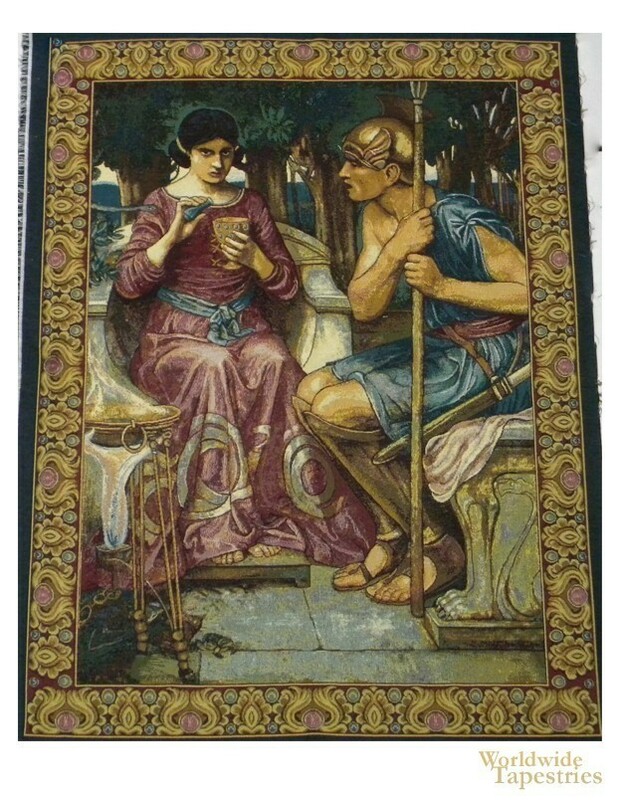 This Giason and Medea art tapestry is based on the artwork of John William Waterhouse from 1907. Here we see the lady Medea, who was the sorceress and daughter of King Aeetes of Colchis. Medea was in love with Jason, the famous Jason and the Golden Fleece, and made him promise to take her with him if he succeeded in claiming the throne, with which she was going to help him. She prepared a unguent or soothing preparation to rub over his weapons and himself to protect from the fire breathing oxen. Here we see Medea and her potions beside Jason. The style, composition and use of color is distinctive and characteristic of the style of Waterhouse. This Giason and Medea tapestry is backed with a lining and a tunnel for easy hanging. Note: tapestry rods and tassels, where pictured, are not included in the price. Dimensions: W 24" x H 34"
Dimensions: W 38" x H 54"